I Love You More Than Carrots: Zoom..Zoom.. Zoom? Come late May, I will be saying goodbye to the first "big girl" car that I purchased with my own big-girl money. I'm sorry, did I say purchase? I meant lease. During the past three years, I've learned that leasing works well for me. Yes, it might be a gross waste of money, however, coming from the girl who tires of brand new, shiny objects both quickly and easily, leasing meant that by the time I became bored, it would be time for something new! Although I've racked up miles upon miles of memories with my little Mazda 3, I'm more than ready for something with a few more.. cylinders, for starters! Since being graced with a driver's license at the ripe age of 17, I've only driven around in 4 cylinder cars. Now, I'm no speedracer, a la Mario Andretti, (although my husband may disagree) but a girl's gotta have a little pick-up now and then and it's gotta happen before reaching 40mph! My little heart desires this.. as I think this would be the perfect little "minivan" to cart Sullivan around in. You know, especially since I refuse to drive a minivan, EVER and this is the next best thing. Don't you think I could definitely play the role of "soccer mom" to a "T" driving around in this beauty! The Acura MDX. 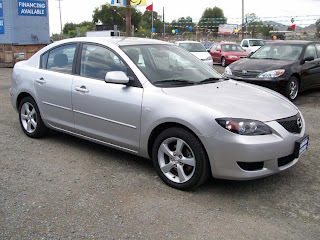 As you can see, we're clearly looking for an SUV-type vehicle and because my husband swears by Acura, as it's been the only make of car he's ever driven, I was left with few choices. And new? Never again. Certified Pre-Owned is more like it. Almost new and still under warranty. So what do YOU drive? Any experience with any of the cars the M household is interested in? I would LOVE to hear feedback! 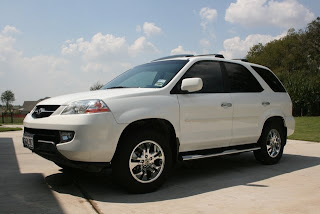 The Acura MDX looks great! !And you should try the BMW x5..."sheer driving Pleasure" they say.I'm 18 and I'm yet to get my car.Goodluck in choosing your next ride. Oh,and I love you! !Even I get tired of my shiny new gadgets pretty soon,and start casting longing eyes at the latest gadgets.Sighs! I love the ford edge. my sis in law has one and its great! Lots of room inside. Oh I love the MDX!! It's so cute and it is great as a sub for the dreaded mini-van! I don't have or have never ridden in either of those cars, but like you I fell in love with the RR. Hubs said a big fat NO to it, as anyone in their right mind would. I guess it is a little ridic to pay that much for a car! Good luck shopping around!! Car shopping is so much fun!! I just bought my 1st SUV (2009Pontiac Torrent) and I love it, my husband has a Mazda CX-9 and I find it rather "long" and hard to park, but it's a great SUV...HAVE FUN!!! I like! Although I like the RR better, the Acura is very nice!! you HAVE TO look at the Lexus RX350..... trust me on this. I drive an Acura and I absolutely love it! ...In fact I'm kinda thinking about moving up to the Acura MDX myself. I can't wait to see what you pick though - they are all awesome cars! I so want a Range Rover. Dream car! I drive a Chev Equinox and love it. It is a very reliable little SUV and has a lot of room for when we need it! I'm glad you found my blog! I've enjoyed reading through your posts on this gloomy day at work! My husband & I have just got a BMW (only a 1 series mind) but it's fantastic! shopping for a new car is so exciting!!! :-) I love both BMWs and Acuras I had a BMW for years and my dad had an Acura and they are both wonderful cars... if you want another option Hyundai Santa Fe is a great SUV and it is really cheap on gas and has XM radio! ;-) Good Luck with your decisions! I drive a Ford Escape Limited which I LOVE. Having the limited version gives it some luxury and it has tons of room. The Edge's are awesome too, I think they would be really similar to the Acura.